One of the most storied rivalries in college football history, the Red River Rivalry between the Oklahoma Sooners and the Texas Longhorns is held annually at the Cotton Bowl in Dallas, right in the middle of the Texas State Fair. Played every year since 1900, before Oklahoma was even a state, the game was long known as the Red River Shootout. Due to concerns about gun violence associations, the name was changed to Red River Rivalry in a 2005 sponsorship agreement with SBC Communications, now AT&T. Prior to the formation of the Big XII conference in 1996, the Red River Rivalry was a non-conference game, often with national title implications. After 1996, that still remained the case on several occasions, and conference superiority often hung in the balance as well. With battles staged in Dallas, Houston (1913), Norman (1922) and Austin (1923) before moving to the current site in 1932, the Red River Rivalry game is played for the honor of the "Golden Hat," kept by the winning school until the next year. 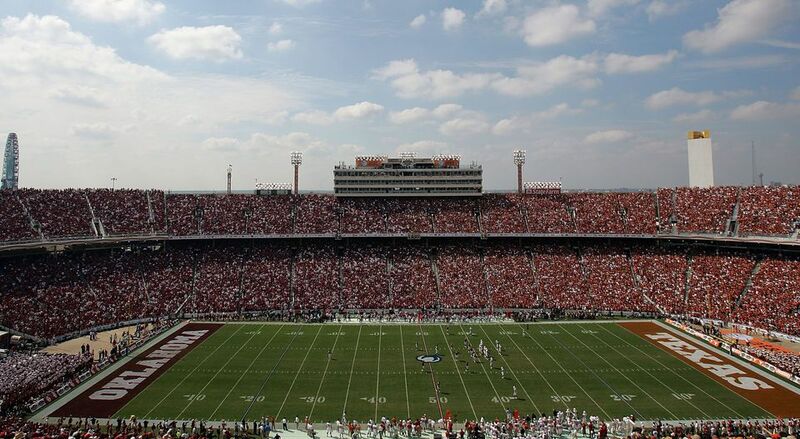 In addition to the festive State Fair atmosphere that surrounds the early October match-up, the game is noted for a 50-yard line split, ticket sales evenly divided between Oklahoma and Texas fans. There aren't many games in college football for which tickets are more difficult to come by than the annual Oklahoma Texas game. A limited number of tickets are made available each year for season ticket holders and students to purchase online. Face value is $110 per ticket. The next best option for Red River Rivalry tickets is to scan the various ticket brokers such as TicketLiquidator (OU Sooners Tickets), StubHub or Ebay and RazorGator. Typically, the success of the teams will determine how far above face tickets are priced. Some fans say the best option for tickets is to simply purchase outside the stadium at the Texas State Fair the morning of the game. This, of course, carries a certain amount of risk. If you're unable to attend the game in person, you're certainly not alone. Fortunately, the Red River Rivalry is televised nationally each year. In recent years, it has been on Fox Sports 1. Throughout the state of Oklahoma, Sooners games are broadcast on Sooner Sports Radio Network affiliates. The drive from the Oklahoma City area to Dallas is a very reasonable one, only about three and a half hours. Therefore, many decide to take their own vehicle or even rent a car to drive down. If you choose to travel by plane, the good news is that there are plenty of flights between OKC and Dallas. Still, it's probably good to check availability and make reservations early. Round trip tickets to Dallas-Fort Worth Airport can be had for as little as $175. Finally, consider traveling by train. Amtrak's Heartland Flyer often has a round trip, Red River Rivalry special for only $55. It leaves the day before and returns the day after, with traveling time of around six hours. If you don't have any friends or family in the Dallas area with whom you can stay, you'll need to book yourself a hotel. Dallas, of course, has plenty of options for hotels, and the Texas State Fair website offers a list of suggestions. Wanting to save a few bucks on the trip? Consider getting a hotel in one of the other suburbs of Dallas such as Fort Worth, Irving or Grand Prairie, especially if you're driving or renting a car. What's the Best Way To Enjoy the 2018 Texas State Fair?